I was always going to be a teacher. A P.E teacher to be precise. Towards the end of my undergraduate degree I applied, interviewed and gained a position on a good course in Bristol. All that was left was to get this dissertation out the way and I was off. My chosen topic was ‘fire history in Alaska, evidence for the Firestone theory’, which related to the very recently published controversial Firestone et al (2007) paper. Myself and two others who were also working on palaeoecological projects in Alaska attended a meeting with Prof. Mary Edwards who told us if we could get the money together we could go with her to collect the samples. So we did. Myself and three colleagues landed in Fairbanks in June 2008 and as they say the rest is history! 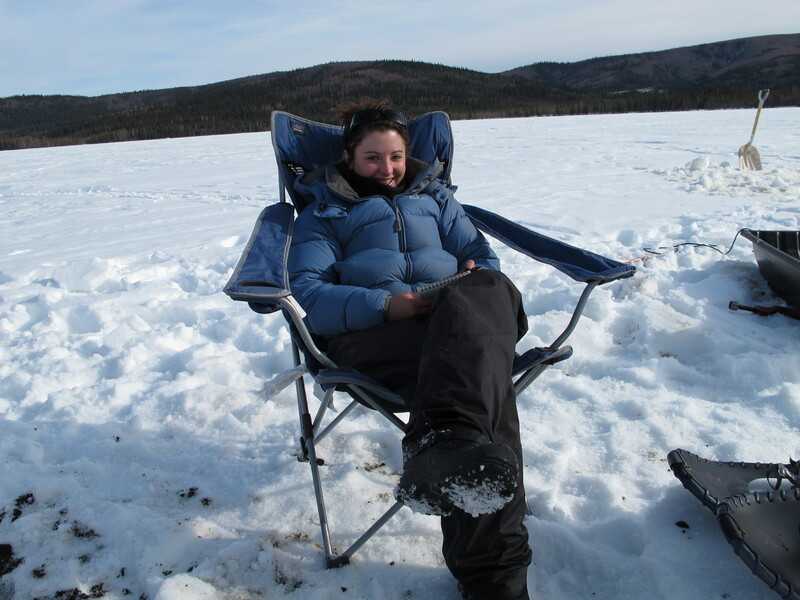 Mary was involved in a new NSF project looking at thermokarst lakes and their role in future climate change. I found the topic fascinating, far more so than my actual dissertation which, by the way if you are interested, showed absolutely no signs of a gigantic fireball hitting North America (were you expecting anything else?). When we returned to the lab Dr Pete Langdon mentioned that he and Mary had a PhD position looking at these lakes and I should think about applying. He said I should also apply for a masters and stay on in the world of academia. Was he talking sense? I’m still not really sure but despite this I dropped out of the teaching course and signed up for a life research. 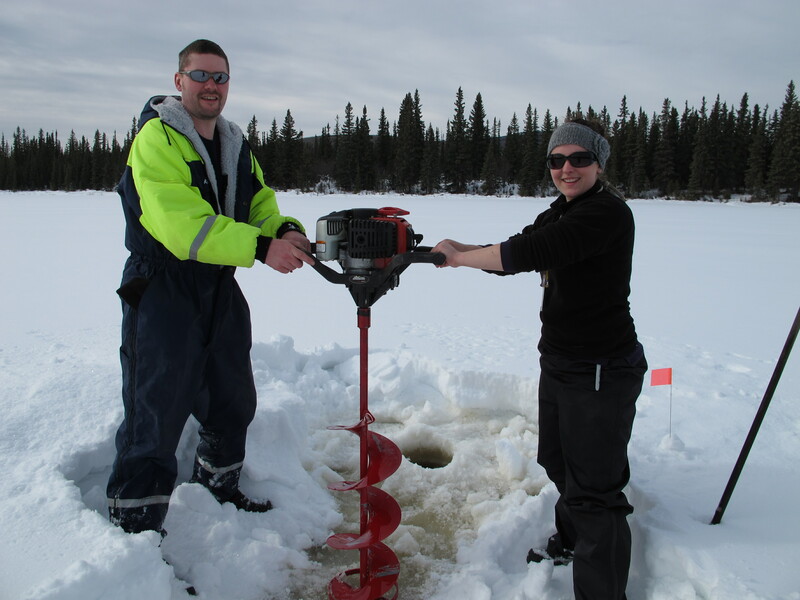 Kim with Dr Pete Langdon, drilling through the ice of an Alaskan thermokarst lake. I undertook the notorious Quaternary Science Masters course at University College London and Royal Holloway. Being taught by some of the best minds in the business meant my interest in the Quaternary grew and grew. I had some fantastic experiences such as working at the Natural History Museum on the ‘shop floor’ interacting with the public and behind the scenes were just some of the highlights. In 2010 I started my PhD back where it all began; Geography and Environment at the University of Southampton. This time around I am looking more closely at thermokarst lakes and whether we can use biological proxies as an indirect method of determining methane emissions through the Holocene. So far I have had two field seasons to Alaska, a month living in far eastern Siberia and a third trip to Alaska is arranged for later in the year! I can safely say that no other job would give me opportunity to visit such amazing places and learn a lot about their history at the same time.